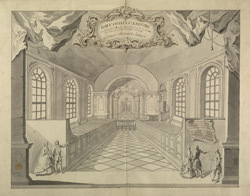 A detailed interior view of Redland Chapel, near Redland Court in the parish of Westbury-upon-Trym, now part of Bristol. This was the Seat of John Cossins Esq.., a London gentlemen who came from a wealthy grocer's family. He married the daughter of a Bristol merchant and settled here. He bought the Redlands estate in the 1730s and replaced the old 17th century manor house with a fashionable mansion lavishly decorated with classical motifs. This chapel interior is also in the classical style. It has huge arched windows to let in light. The alter area is decorated with classical columns, foliage, cherubs and a large painting. The roof is gently curved rather than pointed. To the right is a eight sided pulpit. There is a flagstone floor. The drawing has a theatrical feel with an elaborate cartouche, bunched up curtains in two corners, and figures watching in the foreground.